I was asked to do so with my role of Global Report Coordinator for the UN Decade of Education for Sustainable Development as a backdrop. But also as someone having had numerous experiences in Africa and Asia working on projects seeking to make higher education more relevant and more responsive to the needs of communities and the demands of the labour market in a rapdily changing world. Initially I challenged the sneaky conversion of Sustainable Development into Sustainability and questioned the ‘inflation of meaning’ of both concepts as people and groups from different ideological backgrounds seem to embrace the terms (Shell speaks of sustainable economic growth, for instance, whereas Greenpeace associates sustainability with quite something else). I reminded the audience of George Orwell’s cautionary tale in told in his book “1984” when refering to Big Brother’s language games used to manipulate and control people. He used “newspeak” and “double-think” to remove ambiguity and to unify opposites (compare for instance: clean nuclear energy, sustainable mining, etc.) and the “thought police” to prescribe how people should think and should life their lives (compare: to play their role as consumers and to continuously grow personally as lifelong learners in order to be mobile and flexible in a dynamic labour market). Does this make sustainability and sustainable development useless? Possibly, when we don’t follow the use of the terms critically and when we fail to give it meaning in real contexts that matter to people and the communities of which they are part. The strength of these concepts, at least from an education perspective, lies in the fact that they require meaning-making and contextualization. What sustainability means in Burundi might be different from what sustainability means in Wageningen, The Netherlands where I am writing this. What we might call sustainable today, might turn out to be not so sustainable tomorrow. What is truly sustainable we simply cannot know as we don’t live long enough to determine that what we consider to be sustainable indeed turned out to be sustainable for ever.. So “sustainability” is a dynamic concept both in space and time that is marinated in uncertainty.. What we do know – with a whole lot more certainty – is that the way we live on this Planet can not be sustained for long (although the Planet will go on, certainly without us human beings being around anymore). And, indeed, we also know, or at least I think most of us will agree, that we have a moral obligation to ourselves, to other species and future generations to continuously be searching for ways to tred more lightly on the Earth and to develop lifestyles and values that are more sustainable than the ones we tend to currently support and promote. Paul and I wrote a paper on this for CTA that I like to share here in this occasion. We live in an essentially ‘systemic world’ characterised by multiple causation, interactions and complex feedback loops, yet the dominant educational structures are based on fragmentation rather than connection, relationship and synergy (Sterling, 2000). Universities, confronted with 21st century challenges must therefore not only rediscover, build on and share indigenous ways of knowing and acting, but generate and or adapt new concepts and practices that will contribute to creating a world that is more sustainable. Academics who still believe that universities are Ivory Towers must be willing to make a paradigm shift so that universities become an integral part of the communities that support them. Hence, a challenge to those involved in shaping higher education in agriculture and life sciences is to revisit institutional practices, examine the disciplines and provide more synergy and become more accountable for economic and human development. Education is a means for people to become self-actualized members of society, seeking meaning, contributing to developing their own potential and creating solutions together. A sustainable world without participation and democracy is improbable, and perhaps even impossible (Wals & Jickling, 2002). It cannot be created without the full and democratic involvement of all members of society. Universities therefore must engage their students not so much in learning for knowing, but rather in learning for doing and, indeed, learning for being (Table 1). Learning for being suggests learning that is not of a transmissive nature (i.e. teaching as reproduction) but rather of a transformative nature (i.e. learning as change). The latter requires permeability between disciplines, university and the wider community, and between cultures, along with the competence to integrate, connect, confront and reconcile multiple ways of looking at the world. Focus of reflection What do I now know? What can I now do? Who am I becoming? The struggle to find integrated solutions through participatory, multi-disciplinary, innovation systems seems important, but many ACP universities have not yet been very effective in developing the corresponding competences of their staff or students. In addition to their academic functions, faculty and students must develop a different form of learning, if the university is to take on more societal and developmental functions, or more specifically, is to influence change in a complex environment. Most critical is the issue of the university’s competence to provide training, research and outreach services that appropriately address real-life problems. The university must skilfully identify competence gaps of professionals, farmers, policymakers and other agricultural stakeholders, through collaborative learning for change. It is such engagement with stakeholders that results in innovations that are likely to liberate farmers and nations from the poverty trap and contribute to socio-economic development that does not compromise the future. It calls for the development of innovation cross-cutting competences in which lecturers become facilitators of learning for development for influencing change in society. Linking and strengthening of competences therefore occur at various levels: university, development service providers and the grass-roots community. Figure 1 provides the key elements, functions and relationships that, when holistically considered, make up innovation competence. Unlike academics, who communicate primarily with peers, practitioners find themselves at the interface of researchers, donors, governments, multi-lateral agencies, activists, NGOs, and poor communities, and thus need to be able to operate in multiple communicative modalities (Woolcock, 2006). This means that universities can no longer train students who can only communicate with peers. Communication skills integrate professionals in society and allow them effectively to influence change as members of that social system through participating in rather than studying that system. Lecturers and students must become engaged in co-learning to co-create knowledge through greater interaction between the university and the community. ‘Real’ purpose Status, career development, publications Status, career development, publications Genuine transformation, systemic change? Table 2 Conventional and emerging strands of research (adapted from Dillon & Wals, 2006). When people find solutions that work for them they take charge of their own development and become entrepreneurial thinkers and doers: i.e. people who can cope with and take advantage of uncertainty and complexity. Universities will more and more be required to develop entrepreneurs rather than bureaucrats. But entrepreneurship is not acquired by proclaiming it, or by teaching theory but by practical engagement. To develop entrepreneurs, university lecturers must also become entrepreneurs, in the sense that they must also find workable solutions to problems in diverse contexts. Action research and process consultancy provide mechanisms for enabling lecturers to become educational or research entrepreneurs. In this type of engagement, the focus shifts from getting tasks done to solving a problem or generating new products, which involves a lot of creativity and adaptation. In the future, ACP universities that adopt this new way of thinking and doing business will be given greater recognition as leaders in society where cutting edge new knowledge is generated that can break the cycle of un-sustainable development and consumption patterns tied to un-sustainable economic principles. They will constantly question and reform deeply entrenched unsustainable routines, structures and practices by taking advantage of their privileged position in society, utilising some of the brightest minds the world has to offer, perhaps most importantly, by engaging in a collaborative endeavour in continuously seeking ways to preserve the planet. Finally, the university and the university community as a place where people live and work, where energy is used, food is consumed, waste is created, housing is provided, etc., will have to have to mimic the kind of sustainable practices it seeks to promote in its research and education in the way it runs its own business. The university of the future lives and learns by example. Failing to do so will create a gap between rhetoric and reality and undermine the university’s credibility. Sterling, S. (2001). Sustainable Education: Re-visioning and Change. Schumacher Briefing No. 6. Green Books Ltd.
Wals, A.E.J. & Jickling, B. (2002). “Sustainability” in Higher Education from doublethink and newspeak to critical thinking and meaningful learning. Higher Education Policy, vol. 15, 121-131.
and the Role of Extension’ held at theUniversityofHohenheim,Stuttgart,Germany. Dillon, J. and Wals, A.E.J. (2006) On the dangers of blurring methods, methodologies and ideologies in environmental education research, Environmental Education Research, 12(3/4), pp. 549 – 558. Wals, A.E.J. & Bawden, R. (2000). Integrating sustainability into agricultural education: dealing with complexity, uncertainty and diverging worldviews. Gent:ICA, 48 p.
Woolcock, M. (2006) “Higher Education, PolicySchools, and Development Studies: What Should Masters Degree Students be Taught?”, Journal of International Development, Volume 19, Issue 1 , Pages 55 – 73. 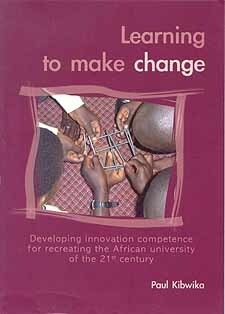 Kibwika, P. (2006) Learning to make change: Developing innovation competence for recreating the African university of the 21st century. Published PhD-Thesis. Wageningen: Wageningen Academic Publishers.